You are here: Home / Ent. / Movie Review; Us. (ThyBlackMan.com) It’s not ordinary. But certainly not extraordinary. Jordan Peele’s follow-up to the box-office-smash Get Out doesn’t expand the boundaries of the horror genre like its predecessor or A Quiet Place did. It’s almost a retreat into norms that bring to mind humorous horror flicks like Scary Movie, zombie thrillers akin to Dawn of the Dead and over-produced shockers like The Shining. Remember the small, indie feel of Get Out? It’s gone. Vanished like a ghost. The Wilsons, an upper-middle-class family in Northern California, have just settled into their lakeside vacation home. They have arrived, physically and symbolically. Thirtysomething-year-old dad, Gabe (Winston Duke, Black Panther), his tween daughter Zora (Shahadi Wright Joseph) and young son Jason (Evan Alex) all want to go to Santa Cruz Beach. It’s got sand, sea, a boardwalk and an amusement park. What’s not to like? Mom, Adelaide (Lupita Nyong’o, Twelve Years a Slave), is dead set against the visit. The thought brings back debilitating PTSD. 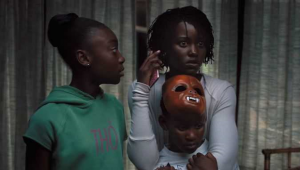 Back in 1986, when she was a kid (Madison Curry) her parents (Yahya Abdul-Mateen II and Anna Diop) brought her to that same amusement park. She wandered off, got lost in an arcade called Vision Quest, and by the time they found her she was traumatized. So distressed, she couldn’t speak and the couple sought therapy for her. A trip to Santa Cruz puts Adelaide in a cold sweat. But her family talks her into it and life is never the same afterwards. For easy-to-please horror genre fans, who don’t ask much from creepy movies, there are enough frights and shocks to satiate: Mirror-image intruders (aka The Tethered), scissors stabbing bodies, blunt force trauma, bodies falling off balconies, boating accidents, heads getting whacked with golf clubs… There are an abundance of thrills. The Wilson family is likable, modern, hip, African American and unapologetically class-conscious. The setting of Northern California and especially the beaches of Santa Cruz are quite inviting. For discerning fans with a more sophisticated palate, Peele’s script is using the doppelganger monsters as a metaphor. They represent the people left behind in the shadows, those who don’t get a chance at the good life. The eerie folks from the netherworld who look like the protagonists become a weird head game that is an effective device, initially. Credit Peele for a very creative and three-dimensional premise. The problem with his ambitious blueprint is that some viewers won’t understand what he’s after. The dialogue is cool, especially Gabe’s funny asides, but none of it is memorable. The main characters are likable, but not all that exceptional. Neither are their close friends the Tyler family, who act like empty-headed millennials. There is an initial shock when the Wilsons meet the family that trespasses on their property. The astonishment of them seeing themselves is icky at first, but that weird feeling subsides. Soon after, the footage drifts into very standard thriller aspects. Chase scenes, people handcuffed to furniture, combat on boats—none of it stretches the imagination. As action occurs, the cutting back-and-forth between scenes seems a bit clumsy. Sometimes it feels like you’re watching a bunch of set pieces and not a group of bone-chilling kinetic sequences that flow with an electric energy. Peele’s direction should get tighter, more desperate and exciting as the film progresses. Instead, it remains at a moderate tempo. Editor Nicholas Monsour has experience with humorous movies (Keanu) and comic TV shows (Cobra Kai). His lack of a background in the horror or thriller genres is evidenced by his non-rhythmic pacing. Even as the film builds to its conclusion, the speed of action and length of scenes stays the same. No sense of real urgency arrives. Nada. There are some plot holes: If Adelaide was so traumatized by Santa Cruz Beach, why does she go back? And if she’s going to return, and is really scared, why would she let her young son out of her sight? When you get to the end of the movie and figure out the game that is being played, her actions make even less sense. Sometimes the characters make irrational decisions and do stupid stuff. The slow pacing leaves some dead time when the camera (Michael Gioulakis, Glass) languishes on the countryside and the musical score (Michael Abels, Get Out) blares with loud string music. That’s when the film feels like the over-stuffed The Shining, heavy on the big buildup and shoddy on the action. The real people wear contemporary costumes that are fitting (costume design by Kym Barrett, The Matrix). The faux folks are stuck in dull red jumpsuits. The film’s prologue mentions thousands of tunnels that run underground in the U.S., like there is a dingy underworld. At the hands and imagination of production designer Ruth De Jong (Manchester by the Sea) the tunnels look like porcelain walls in a fancy spa lobby. The spaces off the halls look like poorly lit high school classrooms. Audiences expecting something dark and sinister like a decayed subway tunnel (e.g. the “L” line in New York City) won’t find one. The Wilsons are as all-American as the family on TV’s Blackish, minus the biting humor. Racial issues are not brought up, it’s not that kind of party. Lupita Nyong’o is a vision as the two moms. Smooth skin, gorgeous lips. She’s is earnest in a very complicated role, especially as Red the demon shadow. Winston Duke is amicable as the dad who has trouble defending his family. Duke plays the father like he’s Jordan Peele’s alter ego. Elisabeth Moss and Tim Heidecker as the heads of the Tyler household don’t get a real chance to fly. The extras who play zombie-types in the tunnel couldn’t frighten a flea. Us never reaches that over-the-edge crescendo into total mayhem that scares you to death and makes a good horror film a great one.